Like pretty much the whole sewing community, when Rifle Paper Co. released their first fabric collaboration with Cotton + Steel, I was smitten. When I found a solitary bolt of one of their rayons at my hometown fabric shop, I was so excited that I didn't even care what color it was. And then 3 yards of this baby blue floral rayon challis sat in my fabric stash for months, because I never wear baby blue. Ever. But this summer was my sister-in-law's wedding, and I figured, "If you can't wear pastel florals to a bridal shower, what can you wear them to?" So I pulled out that rayon and sewed it up into a drapey wrap dress, and I couldn't be happier! It helps that the color is deeper than some baby blues, more evocative of a summer sky than an eighties-era prom getup. It also helps that it's broken up by big patches of colors I love, like coral and navy. 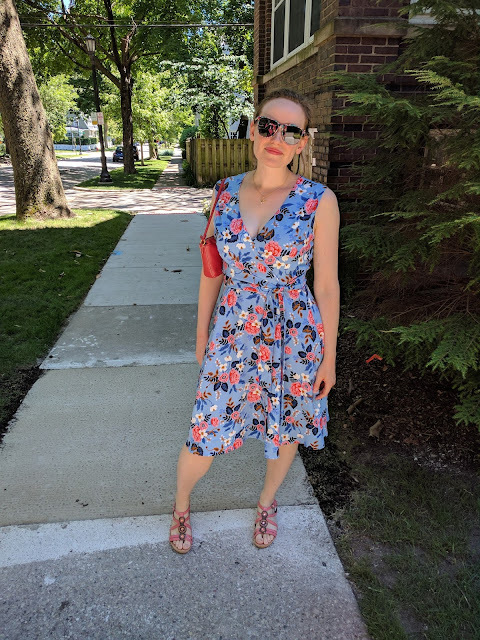 The pattern is Simplicity 8137, a princess-seamed wrap dress (or peplum top) with optional sleeves, a knee-length skirt, and a (presumably quite dramatic) maxi skirt. To give it a little zazz, there's a gathered tie at the waist that cinches everything in and emphasizes an hourglass shape. To give it a little support, there are snaps on the inside, which hold the wrap in place. I sewed the sleeveless top (View A) with the knee length skirt (View B) in a straight size 12. 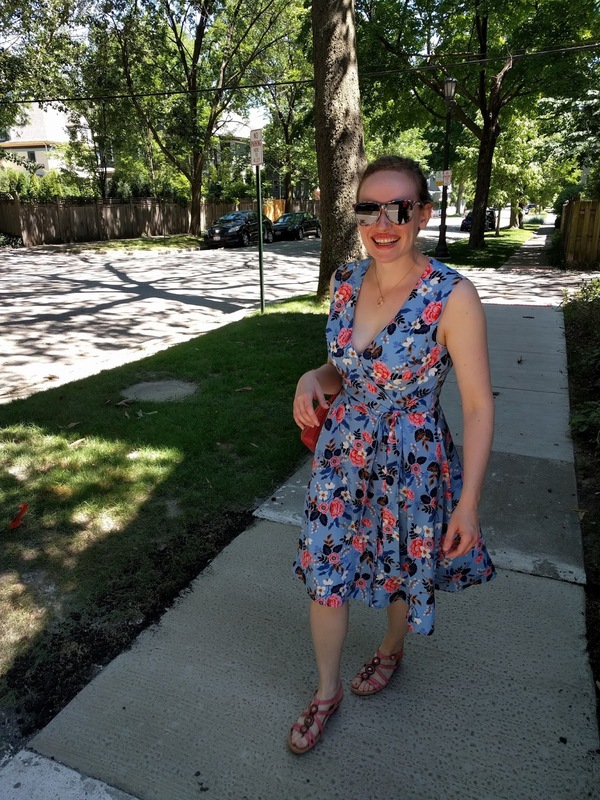 It took one solid day of sewing, from cutting out the fabric pieces to hemming the skirt. To be honest, I've never sewn in all the snaps. I just keep tacking it together in pivotal places each time I wear it. On me, the skirt lands a bit below the knee (I'm 5'6".) I rather like the almost midi-length, though. It feels of-the-moment, and it's a nice balance for the dress's bustiness. 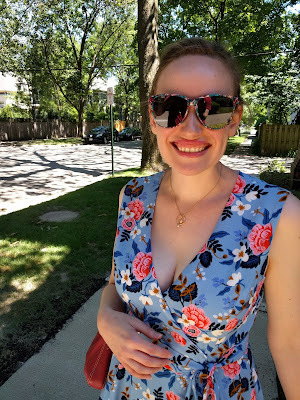 On the envelope, this dress isn't particularly low-cut, but I didn't make any modifications for a D-cup, and what I got was a very deep V-neck. This shall be rectified with one of those snaps, eventually. Even in a smaller cup size, I suspect you might be inclined to tack the center of the V, as both sides of the wrap are designed to fall entirely under the bust. The bodice is lined (the skirt is not), so you get a smooth finish around the armscyes and neckline. 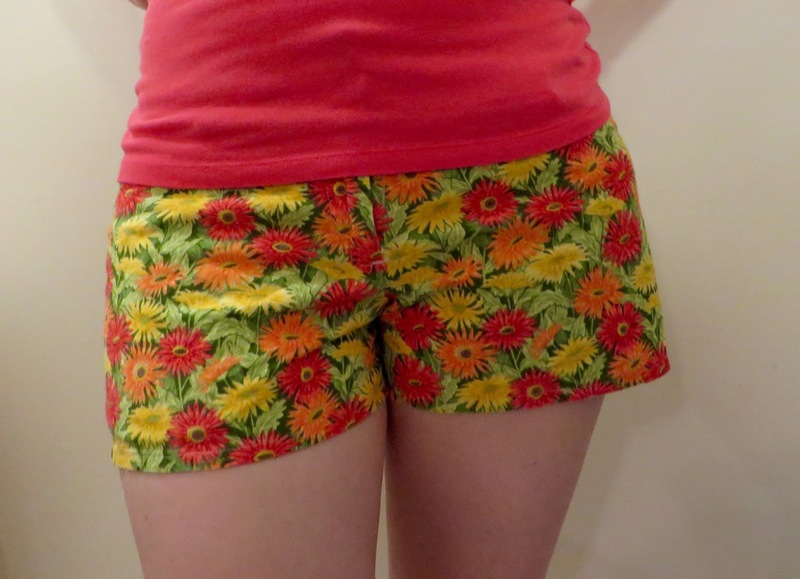 The pattern has you sew most of the lining by machine, except for a few inches. This requires you to make a weird inside-out burrito of you dress bodice, but it does result in a nice finish with minimal hand sewing. I know some people like hand sewing, but I am not among their ranks. 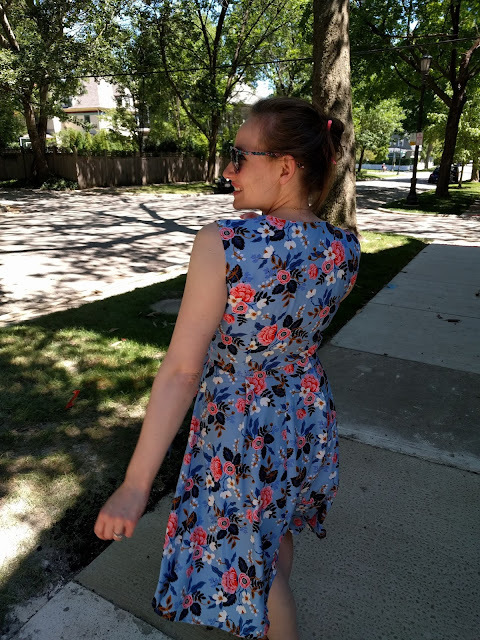 This dress was a fun sew, and I love the result! 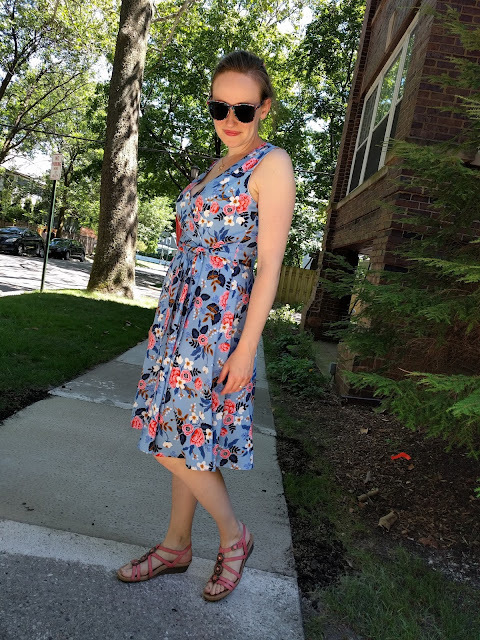 I think that I'll make it one more time in the maxi length, mostly because I'd love to swan around in that many yards of billowy rayon challis, but I'll do a small FBA first. The trouble with making wearable muslins out of crazy fabric is what happens if you actually like them. I made these Maritime Shorts out of a quilting cotton covered in flowers, but then it turned out I loved them! I wore them all last summer, flowers be damned. (I also have a V1247 skirt toile in this fabric.) 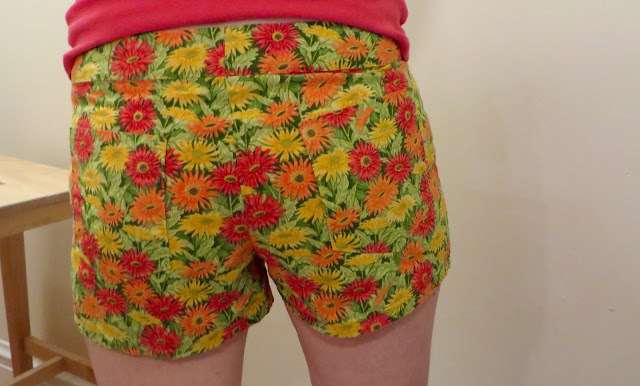 So help me, this summer I'm going to make some in a reasonable fabric. I have some options already: a dotted chambray, a black cotton twill, and some soon-to-be-dyed-with-avocado-pits white denim. I have high hopes for the white denim - how cool would naturally dyed blush pink shorts be?! In the meantime, here's a view of the side and the back. The back view makes me think that next time, I should move the pockets in a bit, but it might just be a perspective thing. I also usually have a shirt over the waistband. I do want to take in the side seams just a smidgen below the hips on the next pair. As they stretch out, they tend to flare a bit more than I prefer near the hem. Modifications: None! But next time, I'd take in the side seams a bit below the hips. I cannot claim responsibility for the choices behind this particular shirt. 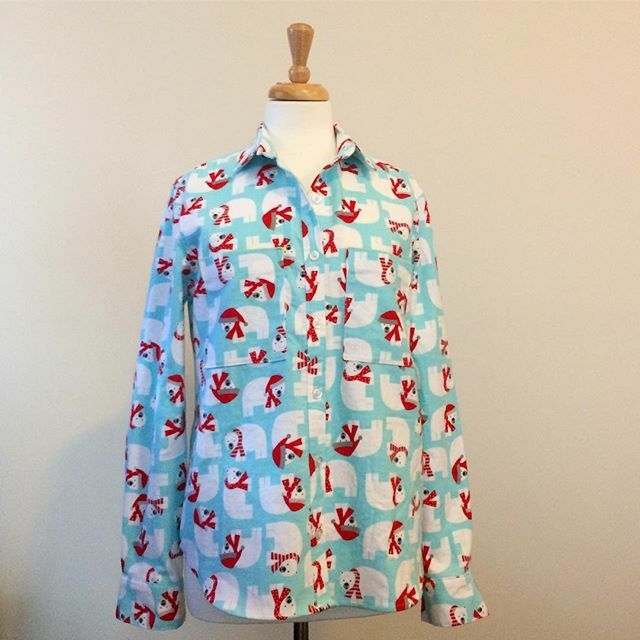 While home for the holidays, my little sister fell in love with this Robert Kaufman flannel featuring cartoon polar bears in Santa apparel. She begged me to please please please make her a flannel shirt out of this fabric, she would love it forever, she would wear it every day, pleeeaaaase. Who am I to say no to that? While I had my doubts, she loves it! She might look like she's wearing jammies all the time, but it's worth it to be swathed in cuddly adorable polar bears, right? Notes for next time: When I make one for myself, I'll probably still make a size 10 for the fit in the shoulders, but trim down the arms a bit. Or, if I'm feeling industrious, make a broad back adjustment. I heard a few people mention that the arms are too long, but I didn't find that. I like my flannels to cover my wrists completely, though. They are, after all, winter wear. Because they only had two yards left at the store, I bought it all, promised I would do what I could, and it just barely worked! 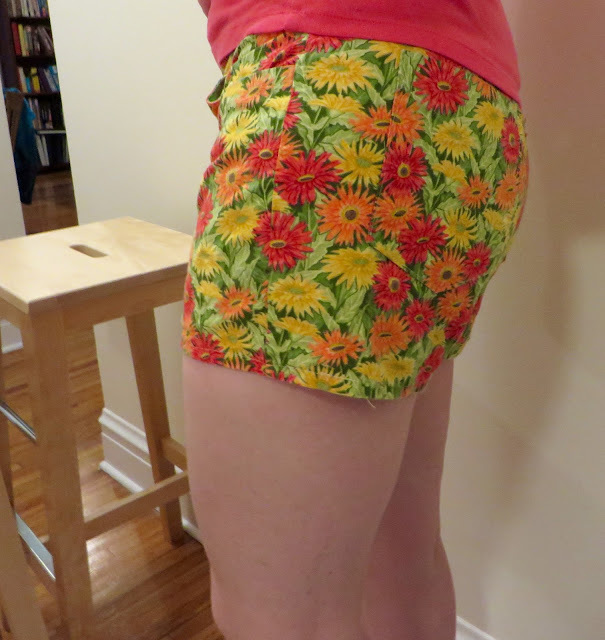 I cut the inside yoke out of a scrap of cotton lawn, but it all fit, albeit with pretty much no pattern matching. I tried to make sure that the rows of polar bears were roughly aligned on each side of the shirt front and that's it. At the end, the biggest scraps I had were maybe 8 inches on the long side. If you were trying to use something in stripes or plaid with this amount of fabric, you'd be doomed. For someone who's never sewn a collared shirt before, the Archer Sewalong was immensely helpful, especially the section on assembling and attaching the collar. I followed it pretty much to a T. The only place I went off-book was on the seam finishes. I finished the armscyes with a flat-felled seam (increase the seam allowance if you want to do this!) and the sleeves/sides with a French seam. Between that and the burrito-method yoke, there are no raw edges! The fabric, one of those Robert Kaufman flannels that's brushed on one side and more like twill on the other, was surprisingly soft after washing, even on the non-brushed side. I would definitely use it again if I wanted, say, a set of pajamas covered in jingle birdies. However, I think my next flannel will be some slightly more reasonable choice, like a Robert Kaufman Mammoth plaid. Seeing other people's posts about the new year and new sewing plans, I've realized one of my biggest goals is to shrink my fabric stash down to a pretty little pile. So, my #2017makenine goals are focused more around getting to the fabrics I have stockpiled. 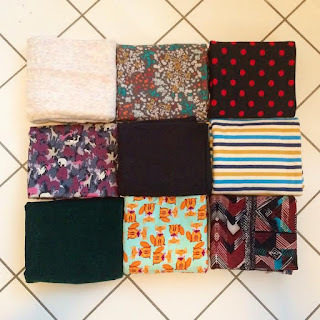 Above, you can see nine of the next fabrics on the docket! Since this post is mostly for me to keep myself accountable, I'll list the planned projects below without further ado. Hi! I'm Karen. I love sewing, art, and science. When I'm not working on a better, more sustainable wardrobe, I'm usually drawing, painting, or geeking out about how to solve climate change. Or at work or running errands. But nobody wants to hear about work and errands.